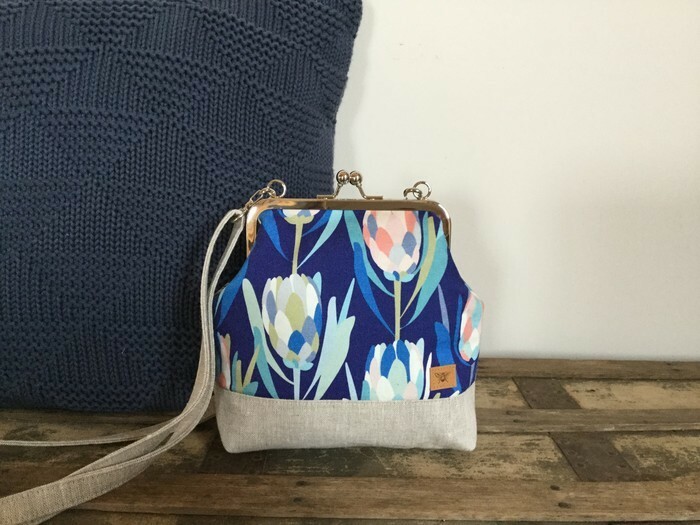 This Small/Long shaped Handbag is made in a Linen/Cotton Protea Print on Blue Background and has a Natural Linen Base. It has a matching 150cm adjustable and detachable Linen Shoulder Strap. It is lined 100% Cotton Fabric with an internal slip pocket and is interfaced and interlined for structure and durability. The purse is made on a 15cm Metal Kiss Lock Frame and measures: 20cm high x 17cm wide x 6cm deep.